But how about the Epic Games Store? 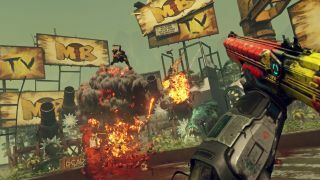 Doom Eternal, Rage 2 and other upcoming Bethesda PC releases will be coming to Steam, the publisher has announced in a tweet. That would, usually, be a bit of a non-story – Valve's Steam store and gaming platform is by far the biggest PC gaming service out there, and games tend to end up there by default. Also headed to Steam will be Fallout 76, ending its Bethesda.net exclusivity, as well as Wolfenstein: Youngblood and Wolfenstein: Cyberpilot. All unreleased titles will also make their way to Bethesda.net, too. It remains a strange announcement, and the only reason we can guess for it is the growing discontent from gamers unhappy with an increase in publishers leaving Steam behind in favour of the Epic Games Store. It's the home of Fortnite on PC, and is gaining traction among publishers for offering better rates than Steam. The reasons why this rankles gamers varies – a lost opportunity for united community, a divided achievements repository and the dilution of Steam sales opportunities among them. Bethesda, for the time being at least, is keeping its options open, and keeping the gamer mob happy.